generated by 3DM Analyst Mine Mapping Suite. Spray-on rock support systems, like shotcrete, have greatly increased safety and productivity in underground mining. 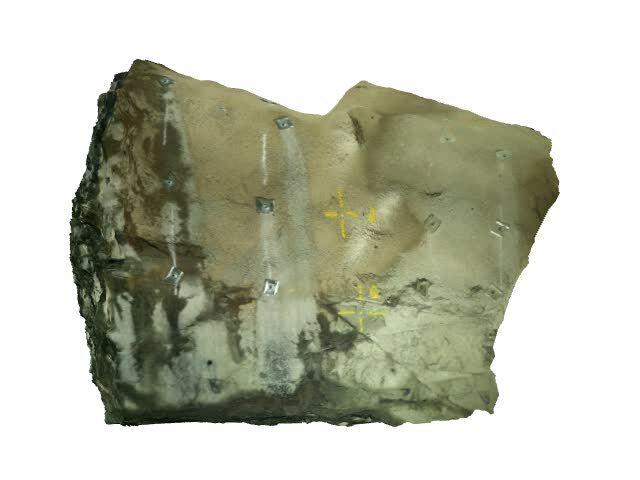 However, because they obscure the rock mass behind the support system once they have been applied, they leave only a brief window of opportunity in the normal mining cycle for a geologist to inspect the rock face. 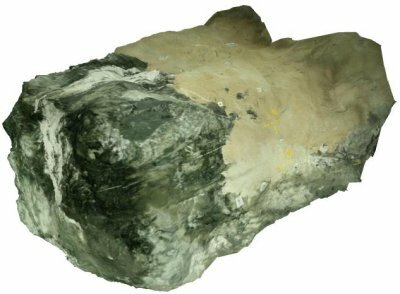 ADAM Technology's 3DM Analyst Mine Mapping Suite is a robust imaging system that is able to capture and georeference essential geological and geotechnical information whilst introducing minimal delay to the normal mining cycle. Images of the face, back, and walls can be captured from the supported area as soon as the round has been mucked out, prior to shotcrete being applied, in under 15 minutes (Figure 1). Images can also be captured again after shotcrete has been applied to measure shotcrete thickness, if desired (Figure 2). Processing of those images to create a 3D model like that shown in Figure 1 or Figure 2 takes less than 10 minutes from start to finish on a modern PC, with about two minutes of that being actual user interaction. ADAM's YouTube channel has a video showing the entire process from start to finish, together with some of the uses of the data once it's been generated. Figure 2. Animation of a 3D model generated by 3DM Analyst Mine Mapping Suite. Figure 3 illustrates how the image capturing process integrates into the existing mining cycle. The area with the yellow background to the left is the existing process, while the green background highlights the new fieldwork steps that must occur prior to shotcrete being applied if the images are to be used for geological and geotechnical analysis. These steps can be completed by a range of personnel, including miners. Painting targets on the walls is an optional step that must be undertaken once at the beginning and periodically after that. Surveying these allows all of the data to be georeferenced in the desired co-ordinate system, and introducing new ones periodically prevents errors from accumulating. The frequency and number of targets required depends on the desired absolute positioning accuracy and the rate of error accumulation. Thanks to the industry-leading bundle adjustment algorithm employed by 3DM Analyst Mine Mapping Suite for this purpose, it requires far fewer surveyed control points for a given level of accuracy than other systems, minimising the surveying workload. Three self-contained LED-based lights designed by ADAM Technology to provide even illumination over the entire area to be mapped with minimal shadowing and daylight colouring so rocks appear the same as they would on the surface. The field component of the system — camera, lens, camera mount, and lights — costs less than US$15,000 and can be easily and cheaply replaced. Because of the speed with which images can be processed ready for analysis, it is possible to have one license of 3DM Analyst Mine Mapping Suite servicing many field units, making the system extremely cost-effective compared to competing technologies. If desired, customers can even purchase their own field kits and send images to ADAM Technology's Data Centre for processing!